ISIS releases a video claiming that Israel carried out attacks in the Sinai Peninsula. The Islamic State (ISIS) on Wednesday claimed in a video that Israel carried out attacks in the Sinai Peninsula, reports Jerusalem Online. The group released a video in which an ISIS terrorist in the Sinai Peninsula can be seen holding up parts of an Israeli bomb with Hebrew writing on it. “These are the remnants of the Jews’ bombing, aided by the dictator Abdel Fattah Al-Sisi,” the terrorist says, referring to the Egyptian president. “Israel has been attacking Sinai day and night,” he charges. The video was published by the Amaq news agency, which has been linked to ISIS. The video shows a vehicle and a structure that were destroyed in an alleged aerial attack that the organization blames on Israel. Sinai Province, the Egyptian affiliate of ISIS which pledged allegiance to the jihadists in 2014, has claimed most of the attacks in the Sinai Peninsula in recent years. Jerusalem Online noted that this is not the first time ISIS has accused Israel of collaborating with Egypt in the fight against the group. Ever since they swore their allegiance to ISIS, spokesmen from the group have been accusing the Egyptian Army and Sisi of conspiring with the enemy. 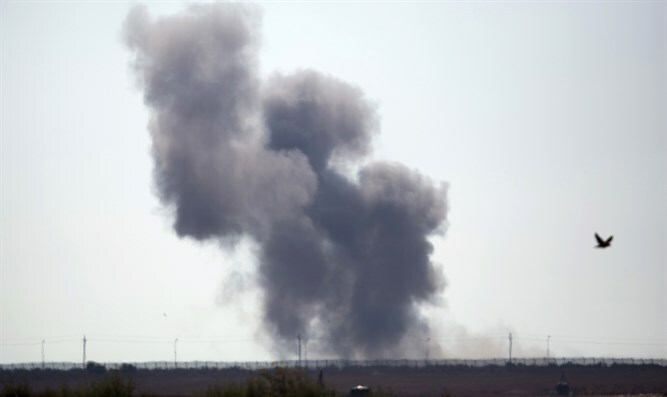 Earlier this year, a report in The New York Times claimed that Israel had launched air strikes against ISIS targets in northern Sinai with Egyptian approval. Egypt’s military spokesperson vehemently denied the report, insisting it is not “credible” and saying that the Egyptian army is the sole entity that is conducting military operations in co-operation with local police forces in certain areas in North Sinai. In February, the Egyptian army launched Operation Sinai 2018 in an attempt to crack down on Sinai terrorism.